it goes on and on...because no WORDS in the human LANGUAGE can express how AMAZING this last week has been....there is NOTHING i can say that will give you a clear PICTURE of what a BLESSING it has been and what it was like....i can only give you a GLIMMER of what an amazing thing it was....so when i tell what happen, in your own words, put in words like: AMAZING, BLESSING, DAZZLING, ROYALTY, AWESOME, OUT OF THIS WORLD, etc....because i am doing this trip an IN JUSTICE by what i am about to write....that is absolutely how AMAZING it was.....we have been BLESSED and dreams DO COME TRUE!!!!! SOOOO, for all those that don't like to read about someone elses trip, the VERY short of it was that it was AMAZING and we had such a BLAST ON OUR TRIP!!! sooooo, get ready read and look at some pictures!! it will take me a bit to write it all down but i WILL DO IT!!! i am actually going to DATE THEM in order of the days we left here starting with APRIL 18 and ending with APRIL 24TH...oh, what a RIDE!! we walked back to our villa and on the way we visited MATTHEW'S BOUNDLESS PLAYGROUND for some fun there....all the boys had so much fun going down the slides and climbing all the way up!! we had fun just swinging and watching the boys!! sooo, today we went to ISLAND OF ADVENTURES to check out a couple of thrill rides and just to say we WENT there....we did discover a COOL place called SEUSS LANDING! and we got to ride a couple of their rides there, everything was so awesome there because it was all DR SEUSS themed park and it was so AWESOME!!! just like who-ville and some other famous books....very AWESOME!! the nurse and i decided we just HAD to get on ONE thrill ride and we chose.......THE DUELING DRAGON ROLLERCOASTER!! here is a VIDEO i found on YOUTUBE!! IT WAS AMAZING!!! i wish i could have done it MORE than once!! and we just walked RIGHT IN with no wait!!! :) soooooo awesome!! well, after a WONDERFUL EVENING, the nurse and i ended up going BACK to the villa so that we could pack all our clothing and get that done...the boys ended up staying and playing some PUTT PUTT and the video games and such....it made it easier so we could get it done BEFORE the boys got there....it was REALLY NICE! here are some pictures from our day out there! SEUSS LANDING there at ISLAND OF ADVENTURES! soooo much fun! HORTON HEARS A WHO!! so DETAILED! CAT IN THE HAT!! cute! so excited to see THE CAT IN THE HAT!!! The Grinch and let me tell you he was in CHARACTER!! very moody! here he is in the car!!! Back at GKTW...wait to take a picture with SANTA! 2 of the 3 boys NOT excited about this!!! :( both josh & matthew SCREAMED and CRIED! "MOM, CAN I TAKE THIS HOME?" he LOVES popcorn like we all do! The decorations for CHRISTMAS DAY at GKTW!!! POSING with MAYOR CLAYTON...the MAYOR of GKTW! IT'S SNOWING AT GKTW!! sooooo exciting! Dad giving kisses all the way around! one for JOSHUA! MATTHEW posing with some characters! ANOTHER BEAUTIFUL DAY in FLORIDA!!!! yes, we were sooooo tired and we could feel it all catching up to us but we were having so much fun that we tried not to let it get us down!! we all got ready and dressed and then had a CONTINENTAL BREAKFAST there at our villa which they came and dropped off....NICE!! then we were OFF!!! sooo, we started our day off by parking our car at MK and taking the monorail over to EPCOT to check things out!! wow, what a GREAT PLACE!!! i think james and i would really enjoy it MORE if we were by ourself out there because of all the different countries and exploring them all! the boys were interested but not by much! we did go and to the CRUSH show which the boys LOVED and we got to meet a couple of characters there too! we also got to take a BREAK at the BASE21 area that is available to the WISH FAMILIES...it is an AMAZING PLACE that is actually part of SIEMENS lounge....very nice!! the very nice lady there was so kind and we were able to cool off and have some beverages and just watch matthew become FASINATED by the floor!! the receptionest could change the color of the floor and matthew could not get ENOUGH!!! AFTER we left there, we took the MONORAIL over to MK to spend the rest of the day there...we just enjoyed doing the rides again that we REALLY liked and just had a fun and walked around....we stayed around for the PARADE OF LIGHTS again and the FIREWORKS SHOW...again, we didn't leave there till 1045 pm...we were SOOOOO TIRED but SOOOO HAPPY!! what an ADVENTURE we were having!!!! visiting with SNOW WHITE!! he was acting all SHY!! CHIP AND DALE! joshua was having NONE OF IT! HEY?! DID YOU SEE THAT?!?! Matthew was AMAZED at BASE21 because their floor changes COLORS!! HE LOVED IT and couldn't stop LAUGHIN!! wow, it changes colors again!!! can we get one of these?!? the beautiful CASTLE at DISNEY! THE PRINCESS AND HER COURT! it's just soooo PRETTY!! so detailed! WOW....this is what it looks like at the end of the day! we caught the daytime PARADE and it was soooo awesome!! some of those TALL PEOPLE came down to matthews level and gave him a high five!! we started our day at SWISS FAMILY ROBINSON TREE and poor james carried matthew all the way UP and down...but he loves his son SOOOOO MUCH that he did it all just so he could experience the attraction...i remember doing this tree as a child when we went to DISNEYLAND in california....looks just like this one! anyway, we did a few rides there and then went over to MINNIES house and to check out some more stuff...we got to take pictures with the star of the place MICKEY MOUSE AND MINNIE MOUSE!! we did TOMORROW LAND and ended up eating lunch there at the burget joint and it was GOOD!! we road some other rides such as IT'S A SMALL WORLD, BUZZLIGHT YEAR, MONSTERS, INC, PETER PAN, THE MAD HATTERS TEA CUPS, etc....and what i ABSOLUTELY LOVED ABOUT IT was that about 99% of the rides both JOSHUA (1 YEARS OLD) and MATTHEW could get on with us!! ABSOLUTELY PERFECT!! we had soooo much fun as a family. just amazing....and EVERY SINGLE TIME, even though we rode the ride SERERAL TIMES in a row, joshua would KICK AND SCREAM cause he did NOT want to GET OFF THE RIDE!!! and i mean, REALLY kick and scream with crocadile tears etc....awwwwww....it would break the hearts of everyone around us!! that is another beautiful thing about THE WISH TRIP....we ALWAYS went to the front of the line....we could ride the ride SEVERAL times if we wanted to without getting off the ride and we NEVER had to stand in ANY line!! :) we were actually able to see the whole park because of that!! if not, the lines were 1+ hours long at each one!!! anyway,we stayed thru so that we could see the LIGHT PARADE and then the FIREWORKS WISHES SHOW....we didn't ended up getting out of there till 1045 pm but oooohhhhh what fun we HAD!! the boys (and all of us) where CRAZY TIRED....but we had sooo much fun!!! we were OFF to GKTW and like always, as we cruised up at 1130 pm, they always welcomed us by saying 'WELCOME HOME!" JUST amazing!!! HERE WE ARE the first place we went to was to RIDE THE TRAIN!!! :) SOOO AWESOME! here we are in front of the WORLD FAMOUS PRINCESS CASTLE!! FINALLY, meeting MICKEY & MINNIE! well the ONLY thing that was BAD that happened to us was that MATTHEWS KIMBA (his wheelchair/stroller) BROKE!!! yes, matthew broke it FINALLY with all his EXCITED JUMPING that he loves to do in his stroller!! at first, we didn't know what to do but i finally thought it thru and we put matthew in joshua's new stroller (THANK YOU GOD he still fit in it!) 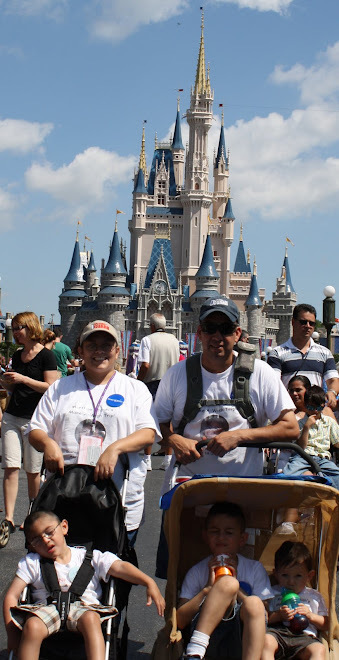 and we would rent a double stroller at the parks for joshua & alex (they gave us FREE RENTALS thru GKTW too!!) i was just sad for matthew because he DEFINETLY had a lower view of the world and i know it was not the most comfortable seat around!! AFTER UNIVERSAL STUDIOS, we came home around 6pm and had some dinner at the GINGERBREAD HOUSE which was YUMMY!!! we were then able to explore the village and do some fun things like PUTT PUTT, RIDE THE TRAIN, LOOK AT THE LITTLE TRAINS, talk to some other families, eat ICE CREAM, and just chill OUT there at the GKTW!!! it was really fun RELAXING time!!! just a PERFECT ending to a WONDERFUL DAY!!! OOOHHHH....SCOBBY DO & SHAGGY!! we love these guys!! MATTHEW and CURIOUS GEORGE...he LOVED this monkey!!! My little gang with CURIOUS GEORGE & TED!!! one of our FAVORITE shows...BARNEY and us!!! we had sooo much fun! Matthew in a boat outside the BARNEY show....it was so hard to get them to leave here! the sign at UNIVERSAL STUDIOS...WE HAD A GREAT DAY! joshua checking out the AWESOME train set they had!! JUST ANOTHER PUTT PUTT shot!! MATTHEW giving daddy a FACIAL with his ice cream cone! he was laughing SOOOOO HARD! giving matthew a smoochie sticky KISS! !